NASA released these images on Tuesday showing algal blooms in Lake St. Clair (above) and Lake Erie (below). 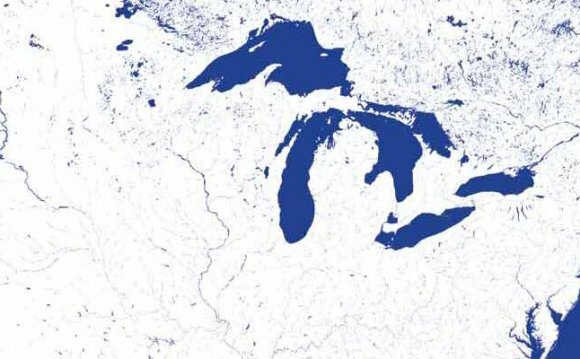 The image was taken by the Operational Land Imager (OLI) on the Landsat 8 satellite on July 28, 2015 as part of a larger effort between NASA, NOAA, U.S. Environmental Protection Agency, and the U.S. Geological Survey (USGS) to protect the public from toxic algal blooms in freshwater. NASA/NOAAAlgal blooms on Lake Erie, captured on July 28, 2015. 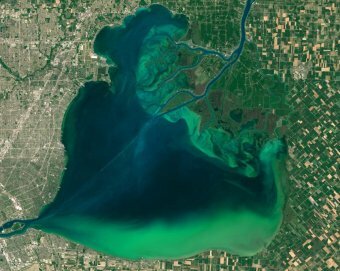 NOAA will continue to monitor the two lakes, using a combination of data derived from weekly water samples, continual sensors that detect pigment these algae produce, and imagery from Landsat 8 and other lower resolution satellites. The addition of NASA’s ocean color processing to the Landsat 8 imagery will improve NOAA’s ability to analyze and forecast algal blooms. NOAA, with data from NASA Aqua and Terra satellitesA satellite timelapse view of the algal blooms in Lake Erie and Lake Sinclair on July 20, 23, and 28, 2015.